This is the second year we invited our relatives over for Chinese New Year lunch gathering where everyone can mingles around as well as enjoy some homecook dishes and cakes prepared by my mum and myself. As usual we have a big group of relatives and to prepare a semi buffet for 30 people in a home base kitchen with gas stove and a microwave convection oven (my built-in oven was down) was rather a bit challenging for us. But thanks god we managed to get all the food up on time and everyone enjoys the array of food and family bonding time too. Hi, it's a brand new week again and I hope everyone has a wonderful weekend and not having any Monday blues today. By the time you read on this "scheduled" post, we were away for June school holidays vacation. And since it's Monday, I prepared this "one-pot dish" recipe which could be done in 10 minutes with some pre-preparation of the ingredients. Braised Seafood Noodles is always one of my favourite noodles dish which sometime I would also cook a similar version using different type of noodles such as rice vermicelli, thick yellow noodles or Macaroni. 1. Heat up frying pan with 1 teaspoon of oil (swirling around the pan). Slowly pour in beaten egg, swirl the pan and evenly spread out the egg mixture to fry the omelette. 2. When done, remove and set aside to cool before slicing it into thin strips. Using the pan and 1 teaspoon of oil, lightly fry both side of the fishcake till slightly brown. Remove and set aside. 4. Stand the noodles in hot water for about 2 minutes. Pour away the water and rinse it 2 - 3 times. Drain well and set aside. 5. Add 1 tablespoon of oil in the frying pan, saute onion, garlic, spring onion and carrot till fragrance. Add in marinated lean pork and give it a quick toss till almost cooked through. 6. Stir in Chinese Cabbage and continue to fry for another minute, pour in chicken broth and 1 teaspoon of oyster sauce. 7. Next add in prawns and cook till it changed colour, stir in the blanched flat yellow noodles, fish cake and let it braised for another minute or two. 8. Remove from heat, garnish noodles with fried shallot, cut chilli and some spring onion and coriander. Serve immediately. 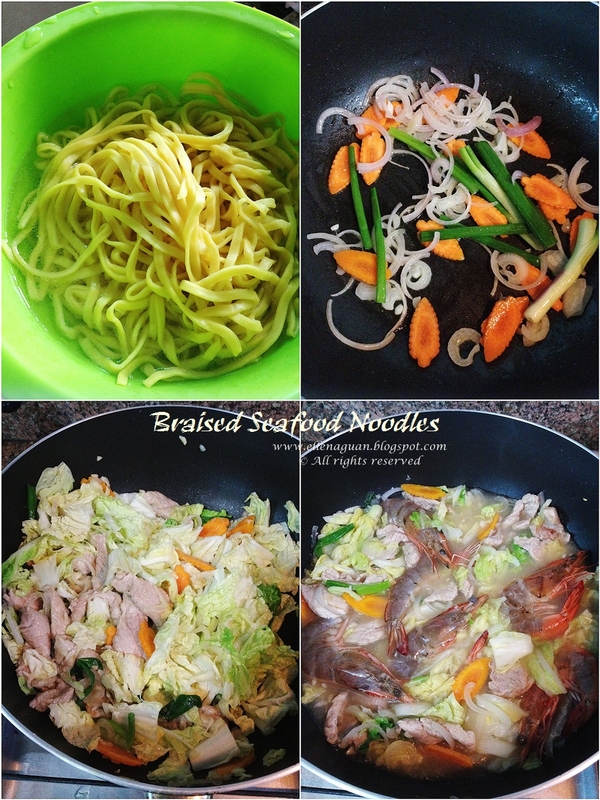 Hope you like this quick and easy "one-pot dish" which would help to cut down some cooking time on busy weekdays dinner. And just a quick tip, prepare necessary ingredients the night before so that you would have ample time preparing this dish when you reached home. This dish is quite dry like those sold at Cze Char Stall, so if you prefer something soupy increase the chicken broth to 1 Litre plus another 500ml of hot water. Minced Meat Noodle also known as "Bak Chor Mee (肉脞面)" is a popular local noodle dish which could be easily found at most food eateries in Singapore. 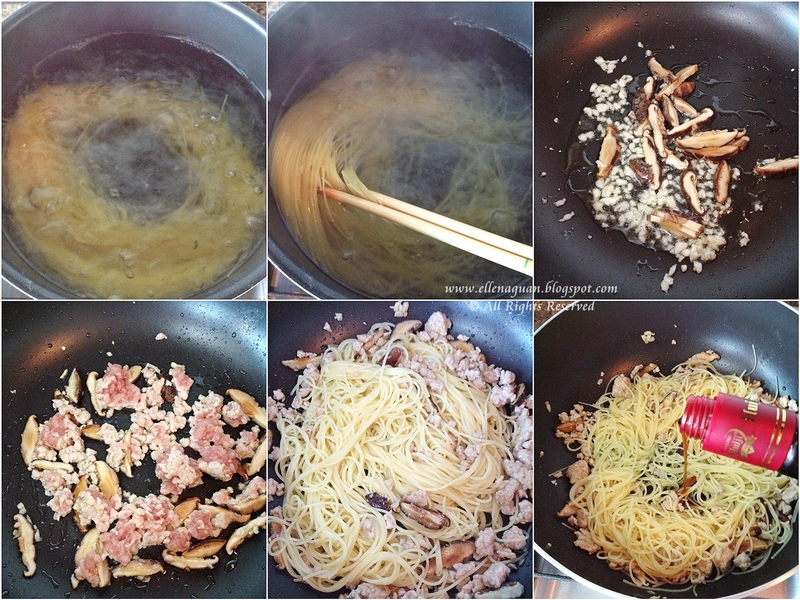 Here I am sharing a version of our quick homemade Minced Meat Noodles which I have added some herbal taste to it. And this dish could also be consumed by woman who is doing confinement or anyone who wish to have a twist of herbal taste from their usual noodle. Our minced meat noodle is made with Angel Hair Pasta instead of those handmade egg noodles which are commonly found at the noodle stalls. And for a fusion taste, I used angel hair pasta which cooks faster and yet with a similar springy texture when compared to the fresh egg noodles. To flavour the taste of the noodles I also add in some Huiji Waist Tonic to act as seasoning instead of using oyster sauce or chilli/tomato sauce. 1. Marinate the minced meat with marinade and set aside. Blanch bok choy with boiling water for 10 – 15 seconds. Remove, rinse with water and set aside to drain. 2. Follow the packaging instruction; blanch pasta in salted boiling water until al dente. Remove and drain well. 3. Preheat frying pan with 1 tablespoon of cooking oil, sauté garlic till fragrant, add in shiitake mushrooms and fry for 30 seconds. 4. Stir in minced meat, fry till fragrant and cook through by using spatula to loosen up the meat cluster, if any. 6. Remove and divide into two serving plates, serve bok choy and sunny side-up egg by the sides. To complete the dish, you could add-on some blanched vegetables, sunny side-up egg, fishballs or etc according to your own preference. I love the addition of the Huiji Waist Tonic which gives the dish a mild herbal taste without over powering it with strong herbal aroma. Indeed this might be a good way to incorporate some nourish herbal treat in our daily meal. Even though I love to use fresh ingredients and herbs in my daily cooking but sometime I do have packets of instant sauce, spices, food and etc in my kitchen pantry to stock up for days where I just wish to cook simple and yet decent dishes for the family. 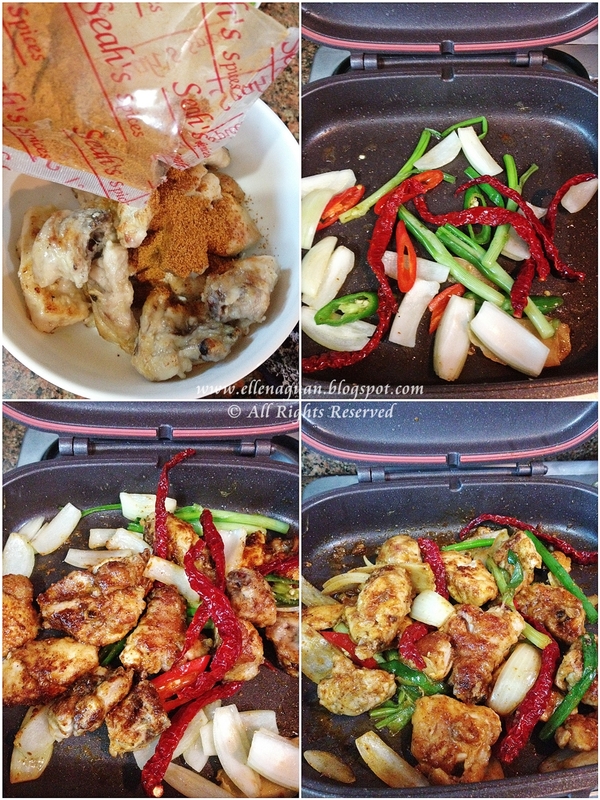 In this post, I am trying out some pre-packed spices which were given by SEAH'S Spices to test out their new products. And as a fan's of SEAH'S Spices especially their Bak Kuet Teh (recipe) and Emperor Herbal Chicken Spices (recipe) which are our family favourite, I am more than willing to try out their new spices. As most of you would known, Seah's spices is 100% locally made in Singapore since 1991 and it is also a leading local brand which is available in all supermarkets and provision stores in Singapore. Recently Seah's Spices has launched 3 NEW spices packet which are Singapore Noodles Spices, Singapore Fried Rice Spices and Kung Pao Spices. Each of these spices above has it's own distinctive flavour which you could incorporate it into your daily cooking to impress your loved one with local delight at the ease of home dining. And also most importantly these spices are with "NO added preservatives and colourings" as well as "NO added MSG". Out of the 3 given spices, I am more interested in their Kung Pao Spices which comes in "powder" form instead of the usual "pre-mixed sauce" that are available in the supermarket. According to the cooking instructions given, the chicken has to be deep-fried before mixing with the spices but for my case on a healthier version I just pan-fried the chicken using Happy Call Pan. 1. Coat and marinate chicken pieces with Seah's spices from the "White Coloured Sachet" found in the packet for about 2 minutes. 2. Preheat Happy Call Pan (HCP) and lightly oil with 1/2 tablespoon of oil. 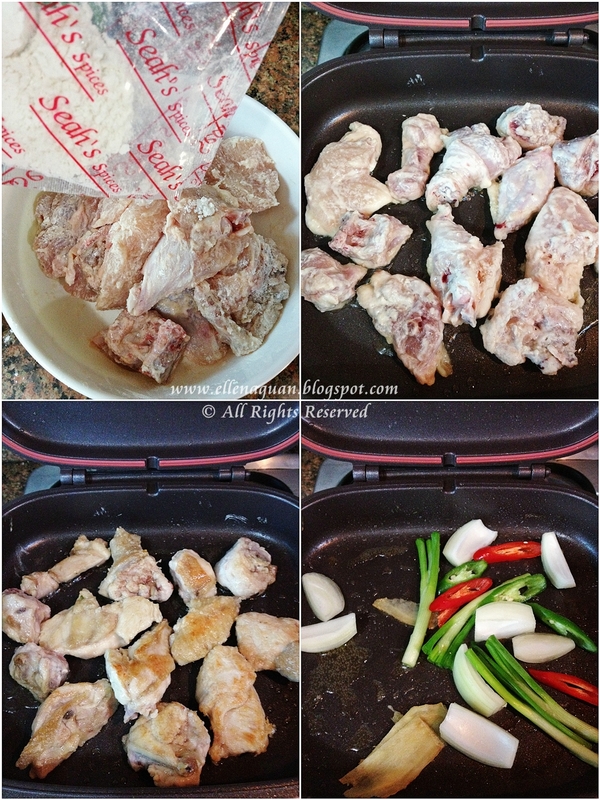 Arrange chicken pieces in the pan, cover and cook for 4 - 5 minutes each side or till chicken is cook with brown outer skin. 3. Removed the chicken, coat it evenly with the spices from the "Red Coloured Sachet" and set side. 4. Add in 1 Tablespoon of oil to the pan, stir-fry onion, chillies and spring onion till fragrant. 5. Stir in the meat and spices and continue to cook for another 1/2 minutes on low heat, covered. 6. Drizzle white vinegar and wine mixture together on the cooked chicken, give it a quick toss and serve hot with steamed rice. For me, I did not add in the whole packet of the "Red Coloured Sachet" (still balance 1/4 packet) and I also added in some sliced fresh chilli so my version of Kung Pao dish is a bit spicy. And after eating a piece or two of the chicken you would feel a "numb" after taste feeling on your tongue due to the spices used. At first when I look at the Noodles Spices I thought it was Singapore Chao Mian Spices. Whenever I order noodles from the Cze Char stall, I would always go for either fried noodles or fried bee hoon if I am not having my usual Fried Hor Fun (fried rice noodles). But now with Seah's new Singapore Noodles Spices I could use it on different types of noodles or even pasta to create new dishes with distinctive Singapore flavour. 1. Bring a pot of water to boil, blanched or cook noodles according, rinse, drain well and set aside. 2. Meanwhile preheat wok/frying pan with 1/2 tablespoon oil, pour in the beaten eggs to the centre of the pan, tilting the pan so that the eggs spread out evenly over the bottom. 3. Cook until the eggs have set on the bottom, using a spatula flip it over and cook on the other side for a minute or two till set. Remove and set aside till cool before slicing it into egg strips. 3. Next add in another 1/2 Tablespoon of oil, saute onion, spring onion, chilli and prawns together till it is slightly pink in colour. 4. Stir in vegetables and continue to cook till vegetables is soften and prawns are cooked through. 5. 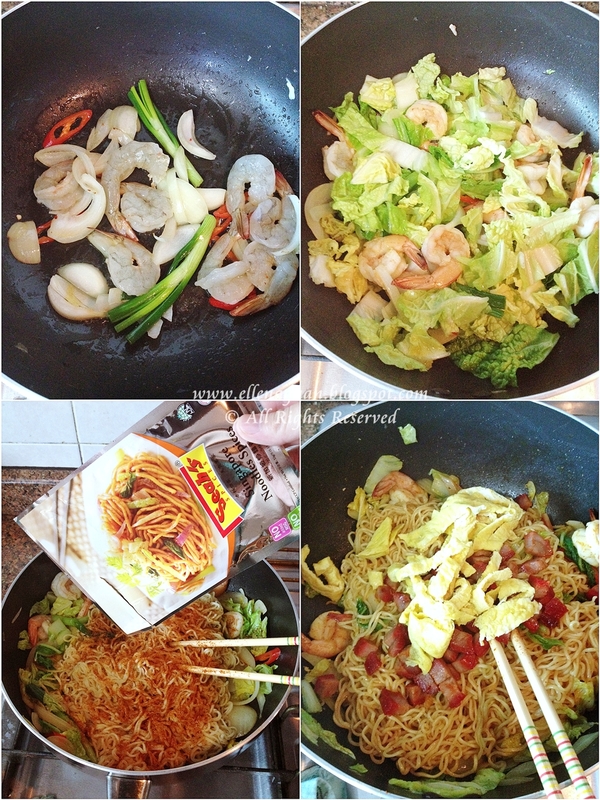 Toss in cooked noodles and Seah's Noodles Spices evenly over the mixture and stir-fry for 3 minutes on medium heat. 6. Lastly turn off the heat, stir-in char siew and egg strips. Divide noodles on serving plates and serve hot. Our opinion this Seah's Noodle Spices has a after taste that resemble instant "Mee Goreng" noodle perhaps due to the spices used. For this recipe, I used the dried egg noodles instead of fresh yellow noodles because we preferred a more springy texture for our fried noodles. Overall we do love the taste of this fried noodles and I am sure it would be something new to share during coming festive season as one of the potluck dishes. Since I am not a fan of "fried rice" I don't really get any fried rice spices for my pantry. Even if I would to cook fried rice, it would be just using simple seasoning such as light/dark soy sauce with some frozen mixed vegetables or egg. To my surprised, Seah's Singapore Fried Rice Spices does not taste any similar to those fried rice from the Cze Char stall but rather it taste quiet similar to Nasi Goreng. 1. Boiled or Grilled the sausages, set aside. Fry sunny side-up eggs individually and set aside too. 2. Add oil in preheat wok, saute garlic till fragrant before stirring in the mixed frozen vegetables and cook for 1 minute. 3. Add cooked rice and continue to stir-fry for 5 minutes over medium heat, stirring occasionally. 4. Gradually add in Seah's spices into the fried rice according to your taste (you might not need the whole packet), stir well, drizzle some cooking wine and continue to stir-fry for another 1/2 minutes. 5. Remove, garnish with prepared sausages, egg and etc shown above. Serve hot. Lastly I would like to thank Seah's Spices for sending us these 3 New Spices, and it's really a good experience to try out these new products before they are available in the supermarkets. So if you are a SEAH'S Spices users, do keep a look out on these NEW products launching in the supermarkets. For more information and updates on SEAH'S Products, you could check out their facebook page HERE. Like their page to receive latest promotion and updates too. When we talk about the word "Ramen", it always lead us to either Japanese or Chinese style type of handmade soup Noodles which often served with meat based broth that is flavored with soy sauce or miso. From then you can select toppings such as sliced pork (Chashu), dried seaweed (Nori), spring onion and etc. 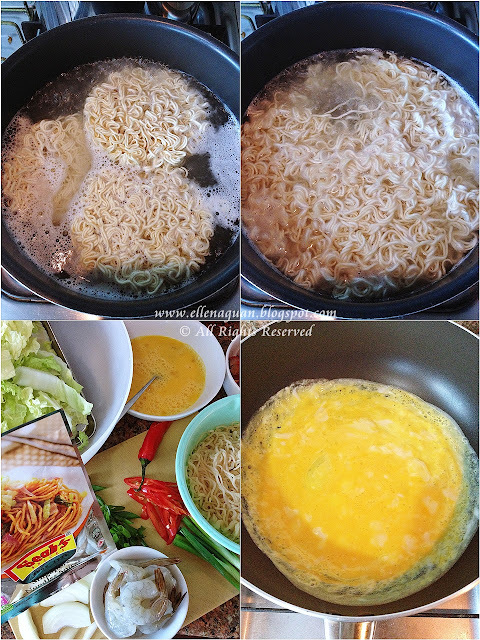 In this post I am sharing the Korean style Ramen which also known as Ramyun/Ramyeon(라면) and it is usually in the form of instant noodles(either cup or packet). 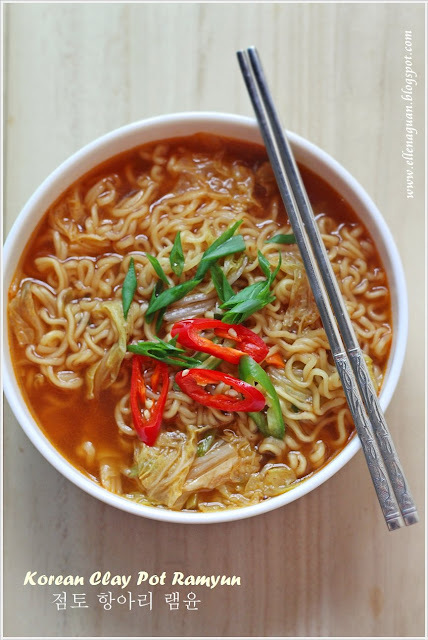 Ramyeon comes is different flavour such as spicy, non-spicy, meat or vegetarian, soup and dry version. And the photo shown in this post is one of their popular "Clay Pot Ramyun" which is spicy and often eaten with kimchi as a topping or on the side. Although I do not encourage regular(such as daily/weekly) consuming of "instant noodles" but I have no obligation to stock up a few packets at home for rainy days or supper. 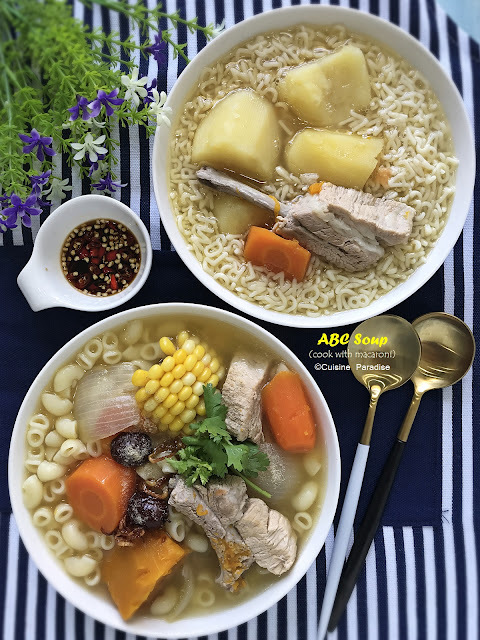 For me, even having simple stuff like instant noodles I would also add in extra ingredients and garnish to make it more nutritious and a hearty dish. 1. Follow the packet instructions, add about 550ml(i use 600ml) of water into a pot and bring to boil. 2. 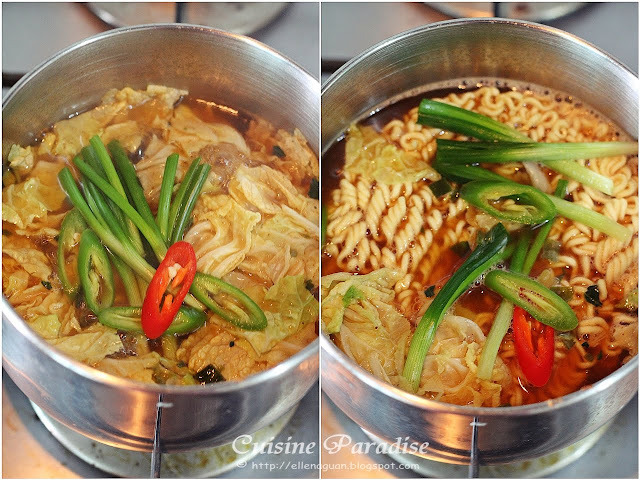 Put noodles, soup powder, spring onion and vegetables(if you are adding extra napa cabbage) together into the boiling water. 3. Simmer for about 4 - 5 minutes till noodle is soften. 4. Dish up, garnish with some sliced chilli and kimchi. Serve hot. Japchae(잡채) is a Korean dish cook with cellophane noodles(glass noodles) which is made from sweet potato starch(dangmyeon) mixed with sesame oil, soy sauce and a variety of vegetables or like the above with some meat such as "beef". In the past, this noodle is usually served at special occasions like weddings, birthdays and parties but now it is often served as a side dish(also known as "banchan") at some Korean restaurants. Friendly speaking I am not a fan of Japchae/Glass Noodles and I remember I did not even pay much attention to it my Korea trip. But lately this Korean-style noodles kept flashing in my mind even since I watched the Korean drama known as "City Hunter(시티헌터 )" cast by Lee Min Ho(李民浩 ) and Park Min Young(樸敏英) where both of them loves to eat this dish in some of the scenes shown. Indeed this Korean Stir-fry Glass Noodles is quite similar to our Asian Stir-fry Cellophane noodles(炒东粉) but in a while Korean noodles are a bit thin in texture compared to ours. Personally I love their sweet and fragrant Japchae sauce which is mainly consists of light soy sauce, sugar, sesame oil and minced garlic. 1. Boil glass noodle in boiling water for about 3 minutes, till soften. Rinse with water, drained well and put in a large bowl. 2. Heat sesame oil in a frying pan, saute minced garlic, brown onion and spring onion till fragrant, stir in shiitake mushrooms and marinated beef strips with 1 Tablespoon of Japache sauce (mix 1 teaspoon of roasted sesame seeds with the pre-mixed Japache sauce included in the pack) and give it a quick toss. 3. Next add in the shredded carrot, cooked noodles and Japache sauce into the pan and cook on low heat, stirring frequently until all the sauce is mixed well. 4. Drizzle some extra sesame oil and mix well before serving. 1. 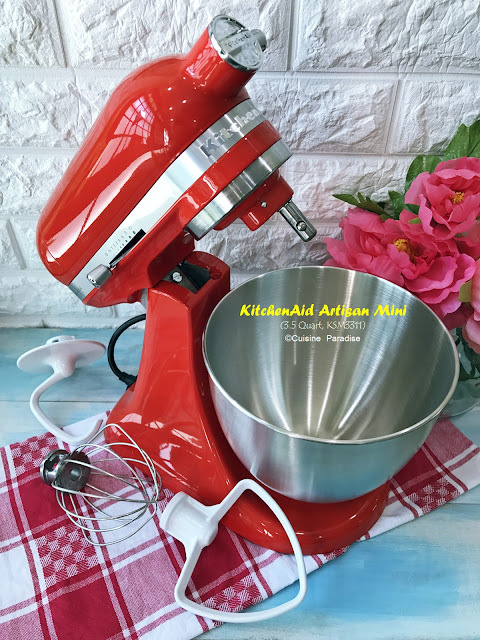 Mix all the ingredients together until sugar dissolved. 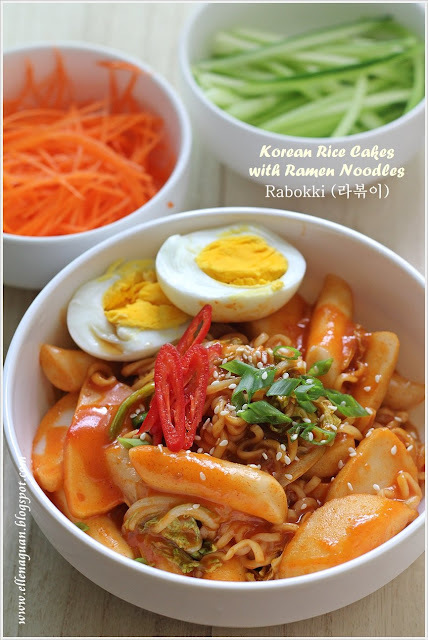 Stay tune for my next Korean dish which is known as "Rabokki(라볶이)", or "Korean Rice Cakes with Ramen Noodles". Kamsahamnida(감사합니다, 좋은 주말 되세요)! With Chinese New Year(CNY) celebration still going on until next Monday, 06 February 2012(the fifteen day of Chinese New Year). Most households are still in the festive mood on preparing auspicious CNY dishes with ingredients such as Abalone, Mushrooms, Black Moss, Sea Cucumber and etc. 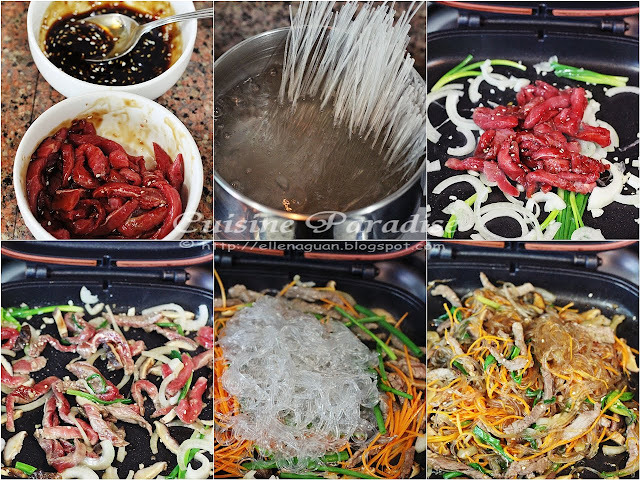 In this post I am using simple ingredients such as rice vermicelli, pumpkin(金瓜 - 金玉满堂), prawns(嘻哈大笑) and mushrooms to prepare a very colourful and auspicious New Year noodle dish for the family.